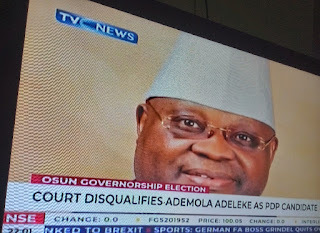 Few days after Osun Governorship Election Tribunal that sat in Abuja declared Senator Ademola Adeleke as the true winner of the September 22 poll, a fresh trouble that might prevent the lawmaker from occupying Osun Government House has emerged. An Abuja High Court on Tuesday, nullified the nomination of Senator Adeleke as candidate of the Peoples Democratic Party (PDP), in the September 22, 2018 governorship election in the state. Adeleke, who currently represents Osun West Senatorial District at the National Assembly was the PDP’s candidate in the poll. Meanwhile, Adeleke’s lawyer Nathaniel Oke ,SAN has faulted the judgment of Justice Musa on the grounds that the judge erred in law by going out of his way to source for evidence to arrive at his “unjust conclusion”. WAEC, however, in the sworn affidavit, confirmed that Adeleke with center number 19645 and candidate number 149 indeed sat for the Senior Secondary School Certificate Examination in May/June 1981 conducted by the council at Ede Muslim School situate at P.O. Box 6 Yidi Road, Ede, State of Osun. The certified true copy of the ledger, marked as exhibit WA1, however showed that Senator Adeleke, sat for only English Language in the examination. Arguing their case, the plaintiffs, through their counsel, Bankole Akomolafe, on Sept 11 claimed that the PDP candidate did not sit for the WAEC examination in 1981 because the Senior Secondary School Certificate Examination had not been introduced in the country as at then.